Lucky number 13 ;) Unfortunately, it was slow-going, and not one of my favorite books so far. 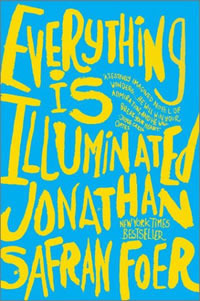 I read 'Everything is Illuminated' by Jonathan Safron Foer to satisfy my 'book set in a different country' requirement. Since hubby's family is originally from around the Ukraine and Lithuania, I figured this would be interesting. It was a pretty dry read, really. I really wanted to like it, since it's being made into a movie (so I assumed the storyline would be more interesting) and based on the popularity of the author's 'Extremely Loud and Incredibly Close.' No such luck. The story started falling more into place by the end, but all of the drivel leading up to that point had already worn out the book's welcome in my Kindle, and I just wanted to finish. I did. Now I will go have a cookie to congratulate myself, but I really wouldn't recommend this book. The fact that it's set in another country doesn't really make it enlightening about the country, and really only had bearing on the story because of the war's effects on the characters they were talking about. Sorry this book didn't work for you. Sometimes that happens. What a bummer! I don't know if I would have read to the end. That is a bummer! I hate when that happens! I know I read the other book you mentioned. The book title sounds interesting but seems like the overall story/content is not that good. For sure you will find a good one next time around.